To enter, follow us on Facebook @MetropolitanTheatres or on Twitter @MetroTheatres or Instragram @metrotheatres and look for sweepstakes posts to enter. ALITA: BATTLE ANGEL Sweepstakes (“Sweepstakes”) is sponsored by Metropolitan Theatre ("Sponsor"). The Sweepstakes begins February 11, 2019 at 12:00 pm Pacific Time (PT) and ends March 3, 2019 at 11:59pm PT. 2. You can enter this Sweepstakes via the Internet. To enter, access one or more of the following social media platforms [facebook.com] Instagram.com and [twitter.com], register for free to open an account. Follow the @MetropolitanTheatres [Facebook] account, @metrotheatres (Instagram) and @MetroTheatres [Twitter] account. Then, follow the instructions from the @MetropolitanTheatres account regarding the Sweepstakes. To enter, click link provided in post and fill out required entry fields. And must like our page on Facebook (@MetropolitanTheatres). BY ENTERING, YOU AGREE TO THESE OFFICIAL RULES. Entries that are late (including delayed data transmissions), forged, illegible, mutilated, incomplete, misdirected, or otherwise not in compliance with these Official Rules will be disqualified. Multiple entries are allowed, up to a maximum of one entry per day per person. Entries that exceed that number will be determined to be void. 3. SELECTION OF WINNER: Winner will be selected by random drawing from all eligible entries by Sponsor, whose decisions are final in all respects. Odds of winning depend on the number of eligible entries received. Potential winner may be notified by Sponsor through contact information provided at time of entry or prize may be mailed out upon sweepstakes close on or about March 4, 2019. If a potential winner cannot be reached after a reasonable effort has been exerted during one (1) day from the date of the first attempt to contact potential winner, or if potential winner he/she is found to be ineligible, or if he/she cannot or does not comply with these Official Rules, an alternate winner may be selected. FIRST PRIZE: One (1) First Prize winner(s) will receive one (1) Prize Pack which includes: One (1) Alita: Battle Angel - The Art and Making of the Movie Book (ARV $45.00) and one (1) Funko POP! 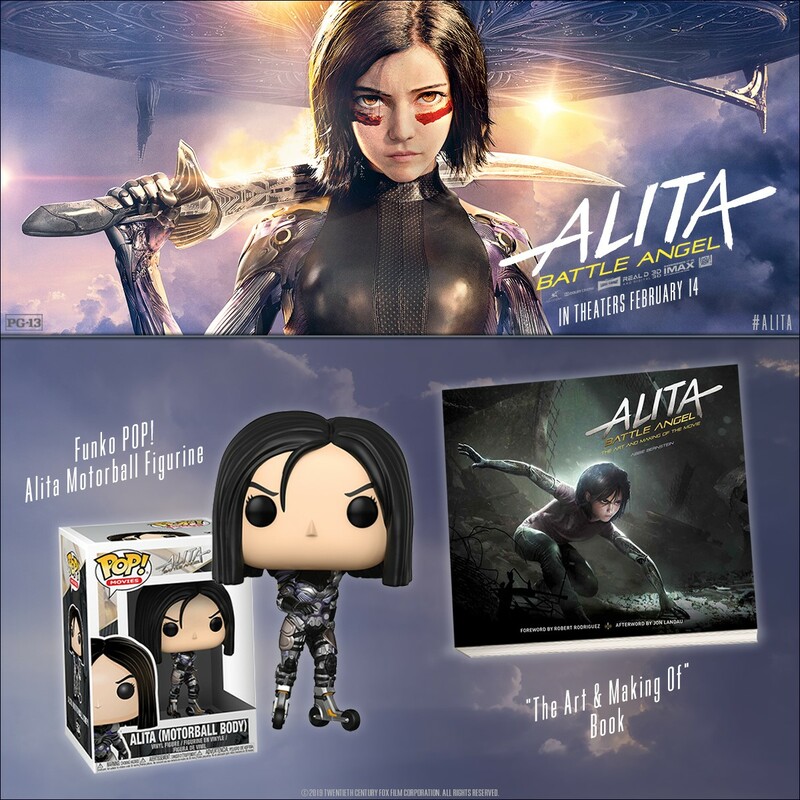 Movies – Alita Motorball Figurine (ARV $25.00), Total ARV per prize pack is $70.00. All incidental expenses and taxes not specified herein will be the sole responsibility of the First Prize Winner, including without limitation, federal and state taxes. Total Approximate prize value: $70.00. 5. CONDITIONS: By entering, participants agree to be bound by these complete Official Rules. All federal, state and local laws and regulations apply. All applicable federal, state and local taxes are the responsibility of the prize winner(s). Sponsor, Twentieth Century Fox Film Corporation (“Fox”), their officers, directors, parent companies, affiliates, subsidiaries and advertising and promotion agencies, and promotion partners (collectively, "Sweepstakes Entities") are not responsible for, (i) late, lost, delayed, damaged, misdirected, incomplete, stolen, postage due or illegible entries; (ii) any injuries, losses, or damages of any kind caused by the prize or resulting from acceptance, possession, or usage of the prize; or (iii) printing, distribution or production errors. Return of prize or prize notification as undeliverable will result in disqualification and an alternate winner may be selected. Entry and/or acceptance of prize(s) constitutes permission for the Sponsor and their agencies to use the winners’ name, address (city and state) and/or likeness for advertising and trade purposes without further compensation or authorization, worldwide and in perpetuity, in any and all forms of media, now known and hereafter devised, including without limitation Internet, unless prohibited by law. Any person attempting to defraud or in any way tamper with this Sweepstakes will be ineligible for prizes and may be prosecuted to the full extent of the law. If, for any reason, the Sweepstakes is not capable of running as originally planned, such as tampering or infection by computer virus, Sponsors at their sole discretion reserve the right to modify, suspend or cancel the Sweepstakes. Void where prohibited. 7. 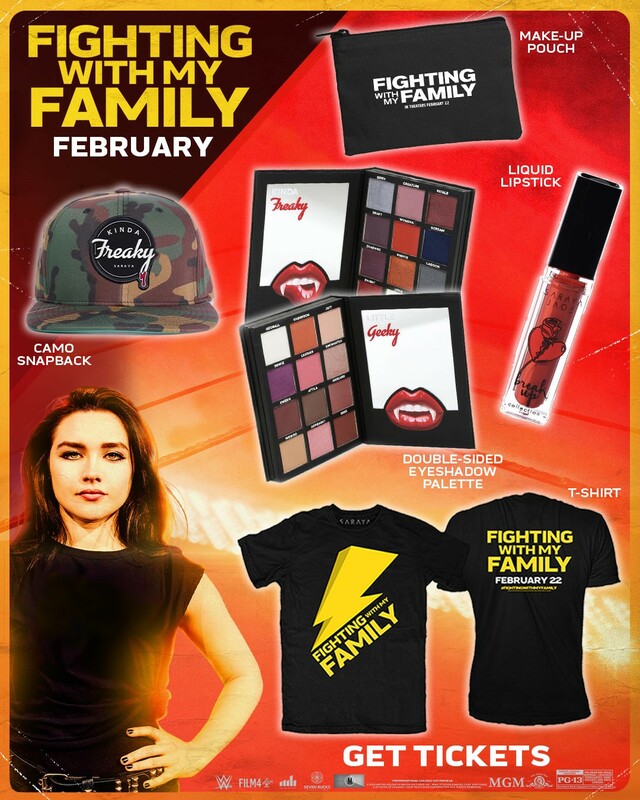 COPY OF OFFICIAL RULES/WINNERS LIST: For a copy of the Official Rules or the name of the winner (please specify), send a self-addressed, stamped envelope to: ALITA: BATTLE ANGEL Sweepstakes c/o 8727 W. 3rd Street, 3rd FL, Los Angeles, CA 90048. ISN’T IT ROMANTIC Sweepstakes (“Sweepstakes”) is sponsored by Metropolitan Theatre ("Sponsor"). The Sweepstakes begins February 11, 2019 at 12:00 pm Pacific Time (PT) and ends March 3, 2019 at 11:59pm PT. FIRST PRIZE: One (1) First Prize winner(s) will receive one (1) Prize Pack which includes: One (1) hat (ARV $15.00), one (1) sweatshirt (ARV $25.00), and one (1) keychain (ARV $5.00), Total ARV per prize pack is $45.00. All incidental expenses and taxes not specified herein will be the sole responsibility of the First Prize Winner, including without limitation, federal and state taxes. Total Approximate prize value: $70.00. 5. CONDITIONS: By entering, participants agree to be bound by these complete Official Rules. All federal, state and local laws and regulations apply. All applicable federal, state and local taxes are the responsibility of the prize winner(s). Sponsor, Warner Bros. (“WB”), their officers, directors, parent companies, affiliates, subsidiaries and advertising and promotion agencies, and promotion partners (collectively, "Sweepstakes Entities") are not responsible for, (i) late, lost, delayed, damaged, misdirected, incomplete, stolen, postage due or illegible entries; (ii) any injuries, losses, or damages of any kind caused by the prize or resulting from acceptance, possession, or usage of the prize; or (iii) printing, distribution or production errors. Return of prize or prize notification as undeliverable will result in disqualification and an alternate winner may be selected. Entry and/or acceptance of prize(s) constitutes permission for the Sponsor and their agencies to use the winners’ name, address (city and state) and/or likeness for advertising and trade purposes without further compensation or authorization, worldwide and in perpetuity, in any and all forms of media, now known and hereafter devised, including without limitation Internet, unless prohibited by law. Any person attempting to defraud or in any way tamper with this Sweepstakes will be ineligible for prizes and may be prosecuted to the full extent of the law. If, for any reason, the Sweepstakes is not capable of running as originally planned, such as tampering or infection by computer virus, Sponsors at their sole discretion reserve the right to modify, suspend or cancel the Sweepstakes. Void where prohibited. 7. COPY OF OFFICIAL RULES/WINNERS LIST: For a copy of the Official Rules or the name of the winner (please specify), send a self-addressed, stamped envelope to: ISN’T IT ROMANTIC Sweepstakes c/o 8727 W. 3rd Street, 3rd FL, Los Angeles, CA 90048. Fighting with My Family Sweepstakes (“Sweepstakes”) is sponsored by Metropolitan Theatre ("Sponsor"). The Sweepstakes begins February 15, 2019 at 4:00 pm Pacific Time (PT) and ends March 10, 2018 at 11:59pm PT. 3. SELECTION OF WINNER: Winner will be selected by random drawing from all eligible entries by Sponsor, whose decisions are final in all respects. Odds of winning depend on the number of eligible entries received. Potential winner may be notified by Sponsor through contact information provided at time of entry or prize may be mailed out upon sweepstakes close on or about March 11, 2019. If a potential winner cannot be reached after a reasonable effort has been exerted during one (1) day from the date of the first attempt to contact potential winner, or if potential winner he/she is found to be ineligible, or if he/she cannot or does not comply with these Official Rules, an alternate winner may be selected. FIRST PRIZE: Two (2) First Prize winner(s) will receive one (1) Prize which includes: One (1) hat, One (1) t-shirt, One (1) makeup pouch, One (1) eye-shadow palette, and One (1) liquid lipstick.. Prize pack (ARV $45.00). All incidental expenses and taxes not specified herein will be the sole responsibility of the First Prize Winner, including without limitation, federal and state taxes. Total approximate prize value: $90. 5. CONDITIONS: By entering, participants agree to be bound by these complete Official Rules. All federal, state and local laws and regulations apply. All applicable federal, state and local taxes are the responsibility of the prize winner(s). Sponsor, MGM / Annapurna Pictures (“MGM”), their officers, directors, parent companies, affiliates, subsidiaries and advertising and promotion agencies, and promotion partners (collectively, "Sweepstakes Entities") are not responsible for, (i) late, lost, delayed, damaged, misdirected, incomplete, stolen, postage due or illegible entries; (ii) any injuries, losses, or damages of any kind caused by the prize or resulting from acceptance, possession, or usage of the prize; or (iii) printing, distribution or production errors. Return of prize or prize notification as undeliverable will result in disqualification and an alternate winner may be selected. Entry and/or acceptance of prize(s) constitutes permission for the Sponsor and their agencies to use the winners’ name, address (city and state) and/or likeness for advertising and trade purposes without further compensation or authorization, worldwide and in perpetuity, in any and all forms of media, now known and hereafter devised, including without limitation Internet, unless prohibited by law. Any person attempting to defraud or in any way tamper with this Sweepstakes will be ineligible for prizes and may be prosecuted to the full extent of the law. If, for any reason, the Sweepstakes is not capable of running as originally planned, such as tampering or infection by computer virus, Sponsors at their sole discretion reserve the right to modify, suspend or cancel the Sweepstakes. Void where prohibited. 7. COPY OF OFFICIAL RULES/WINNERS LIST: For a copy of the Official Rules or the name of the winner (please specify), send a self-addressed, stamped envelope to: Fighting with My Family Sweepstakes c/o Metropolitan Theatres 8727 W. Third Street, Los Angeles, CA 90048. 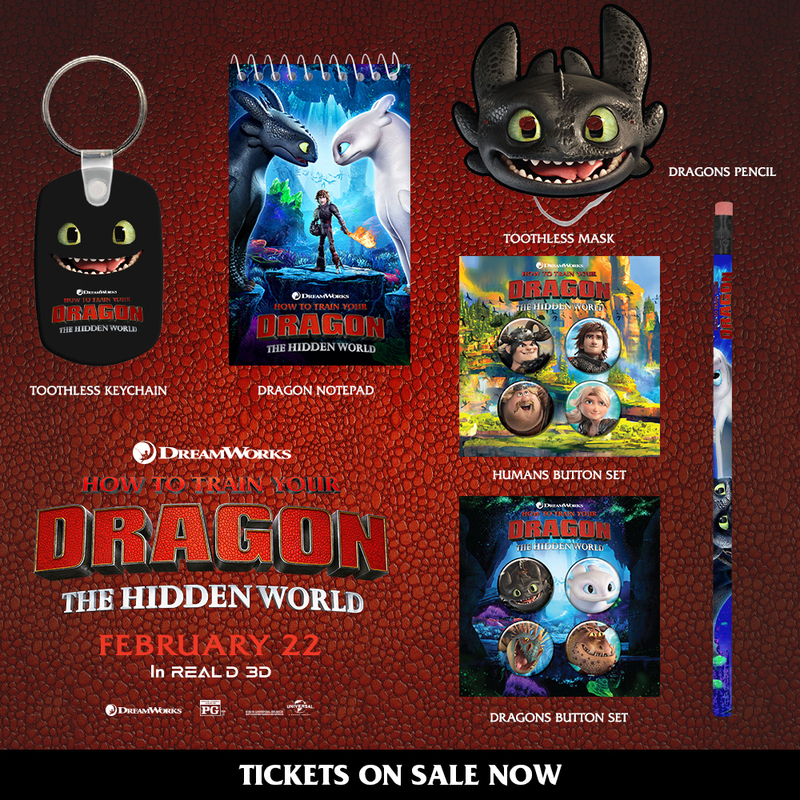 HOW TO TRAIN YOUR DRAGON Sweepstakes (“Sweepstakes”) is sponsored by Metropolitan Theatre ("Sponsor"). The Sweepstakes begins February 19, 2019 at 4:00 pm Pacific Time (PT) and ends March 10, 2018 at 11:59pm PT. FIRST PRIZE: Two (2) First Prize winner(s) will receive one (1) Prize which includes: one (1) button set, one (1) mask, one (1) keychain, one (1) notepad, one (1) pencil, and one (1) bag. Total ARV is $24.50 All incidental expenses and taxes not specified herein will be the sole responsibility of the First Prize Winner, including without limitation, federal and state taxes. Total approximate prize value: $49. 5. CONDITIONS: By entering, participants agree to be bound by these complete Official Rules. All federal, state and local laws and regulations apply. All applicable federal, state and local taxes are the responsibility of the prize winner(s). Sponsor, Universal Pictures (“Universal”), their officers, directors, parent companies, affiliates, subsidiaries and advertising and promotion agencies, and promotion partners (collectively, "Sweepstakes Entities") are not responsible for, (i) late, lost, delayed, damaged, misdirected, incomplete, stolen, postage due or illegible entries; (ii) any injuries, losses, or damages of any kind caused by the prize or resulting from acceptance, possession, or usage of the prize; or (iii) printing, distribution or production errors. Return of prize or prize notification as undeliverable will result in disqualification and an alternate winner may be selected. Entry and/or acceptance of prize(s) constitutes permission for the Sponsor and their agencies to use the winners’ name, address (city and state) and/or likeness for advertising and trade purposes without further compensation or authorization, worldwide and in perpetuity, in any and all forms of media, now known and hereafter devised, including without limitation Internet, unless prohibited by law. Any person attempting to defraud or in any way tamper with this Sweepstakes will be ineligible for prizes and may be prosecuted to the full extent of the law. If, for any reason, the Sweepstakes is not capable of running as originally planned, such as tampering or infection by computer virus, Sponsors at their sole discretion reserve the right to modify, suspend or cancel the Sweepstakes. Void where prohibited. 7. COPY OF OFFICIAL RULES/WINNERS LIST: For a copy of the Official Rules or the name of the winner (please specify), send a self-addressed, stamped envelope to: How to Train My Dragon Sweepstakes c/o Metropolitan Theatres 8727 W. Third Street, Los Angeles, CA 90048. CAPTAIN MARVEL Sweepstakes (“Sweepstakes”) is sponsored by Metropolitan Theatre ("Sponsor"). The Sweepstakes begins February 25, 2019 at 5:00 pm Pacific Time (PT) and ends March 17, 2019 at 11:59pm ET. 3. SELECTION OF WINNER: Winner will be selected by random drawing from all eligible entries by Sponsor, whose decisions are final in all respects. Odds of winning depend on the number of eligible entries received. Potential winner may be notified by Sponsor through contact information provided at time of entry or prize may be mailed out upon sweepstakes close on or about March 18, 2019. If a potential winner cannot be reached after a reasonable effort has been exerted during one (1) day from the date of the first attempt to contact potential winner, or if potential winner he/she is found to be ineligible, or if he/she cannot or does not comply with these Official Rules, an alternate winner may be selected. FIRST PRIZE: One (1) First Prize winner(s) will receive one (1) Prize Pack which includes: One (1) t-shirt (ARV $15.00), one (1) travel mug (APV $15.00), one (1) fanny pack (APR $15.00), one (1) pair of sunglasses (APR $15.00), one (1) pen (APR $10.00), and one (1) hair band (ARV $5.00), Total ARV per prize pack is $75.00. All incidental expenses and taxes not specified herein will be the sole responsibility of the First Prize Winner, including without limitation, federal and state taxes. Total Approximate prize value: $75.00. 5. CONDITIONS: By entering, participants agree to be bound by these complete Official Rules. All federal, state and local laws and regulations apply. All applicable federal, state and local taxes are the responsibility of the prize winner(s). Sponsor, The Walt Disney Corporation (“Disney”), their officers, directors, parent companies, affiliates, subsidiaries and advertising and promotion agencies, and promotion partners (collectively, "Sweepstakes Entities") are not responsible for, (i) late, lost, delayed, damaged, misdirected, incomplete, stolen, postage due or illegible entries; (ii) any injuries, losses, or damages of any kind caused by the prize or resulting from acceptance, possession, or usage of the prize; or (iii) printing, distribution or production errors. Return of prize or prize notification as undeliverable will result in disqualification and an alternate winner may be selected. Entry and/or acceptance of prize(s) constitutes permission for the Sponsor and their agencies to use the winners’ name, address (city and state) and/or likeness for advertising and trade purposes without further compensation or authorization, worldwide and in perpetuity, in any and all forms of media, now known and hereafter devised, including without limitation Internet, unless prohibited by law. Any person attempting to defraud or in any way tamper with this Sweepstakes will be ineligible for prizes and may be prosecuted to the full extent of the law. If, for any reason, the Sweepstakes is not capable of running as originally planned, such as tampering or infection by computer virus, Sponsors at their sole discretion reserve the right to modify, suspend or cancel the Sweepstakes. Void where prohibited. 7. 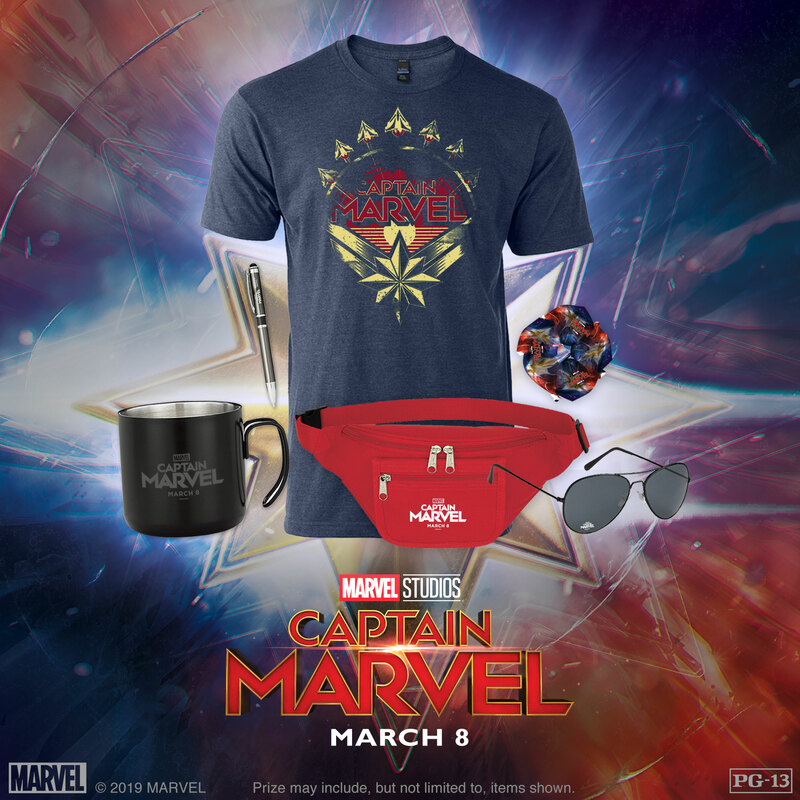 COPY OF OFFICIAL RULES/WINNERS LIST: For a copy of the Official Rules or the name of the winner (please specify), send a self-addressed, stamped envelope to: CAPTAIN MARVEL Sweepstakes c/o 8727 W. 3rd Street, 3rd FL, Los Angeles, CA 90048.